Images via the links below. So it turns out I have a couple of more gifts to get and no time to pound the pavement. So late last night I did a little searching online. I love these little mushroom pots from Conran Shop, ¥1,575. Then I was thinking of putting together a collage kit for a crafty friend with this lace paper stamp from Otogimura, ¥1,575 and antique keys from Droguerie, ¥450 each. The only danger here is that I'm going to end up buying 2 of everything because it's just too cute not to have in my craft drawer. Next up is the bunny lamp from Di-Classe, ¥5,700. I could conveniently give this to my daughter, so I can look at it every night. Is that wrong? There's also a squirrel lamp that I mentioned back here. Some cool vintage stamps from Otogimura, ¥250 for 10, would be nice in the collage kit. Sadly, they were sold out of the really cute mushroom stamp set. 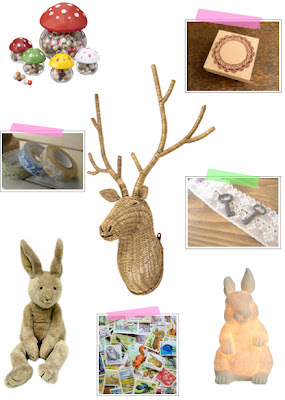 The toy rabbit might end up being a gift for friends with a baby on the way, ¥3,990 at the Conran Shop. What would a collage kit be without washi tape (¥170 each from Droguerie)? The coolest thing I found was this wicker deer that's a wall hanging/lamp (¥9,800 from Franc Franc)! I was thinking about this for my husband, but there are 2 problems. One, I already got his gift. Two, my husband is uncomfortable with hanging animal heads on the wall, real or wicker. So I guess that pretty much rules this out, even though I REALLY want it. Well, I think I've figured out a few things by blogging it out ... I'm one of those people who is guilty of shopping more for themselves when gift giving, oh dear. Or should I say Oh DEER! Like everyone, I've got a lot going this holiday season, so blogging will have to take a back until January. So, off to do my holiday things! Hahaha, those cute little craft can really makes a good decoration for my house this season greeting...Merry Christmas and Happy New Year!